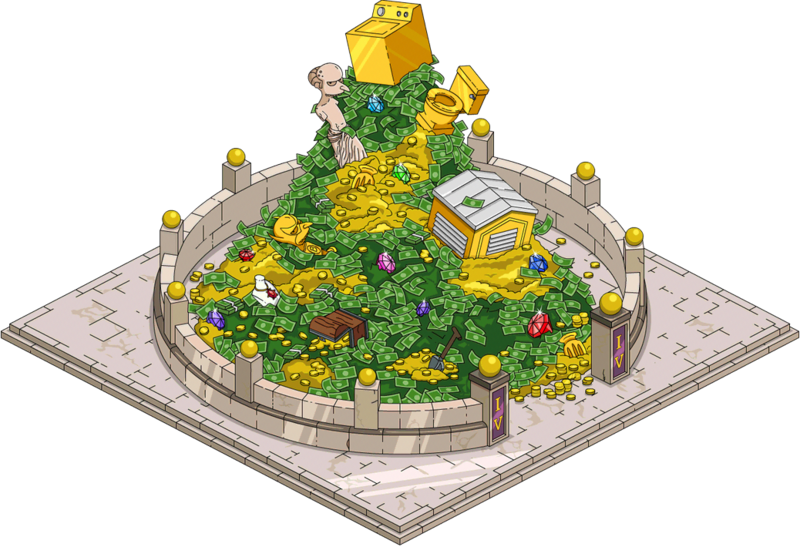 Yesterday Level 52 hit our Tapping Devices and with it arrived a permanent mini event involving Mr. Burns and his Money Mountain. 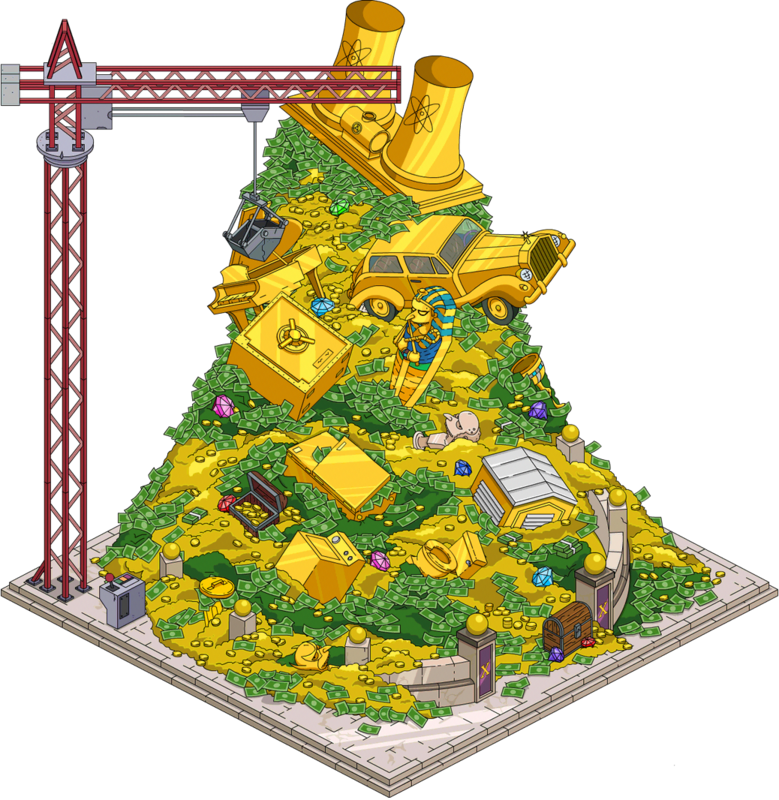 The Money Mountain is meant to be a long term “project” for you to work on over time in Springfield. It’s massive and expensive, so breaking it up over time will help lessen the blow to your in game cash bank account. 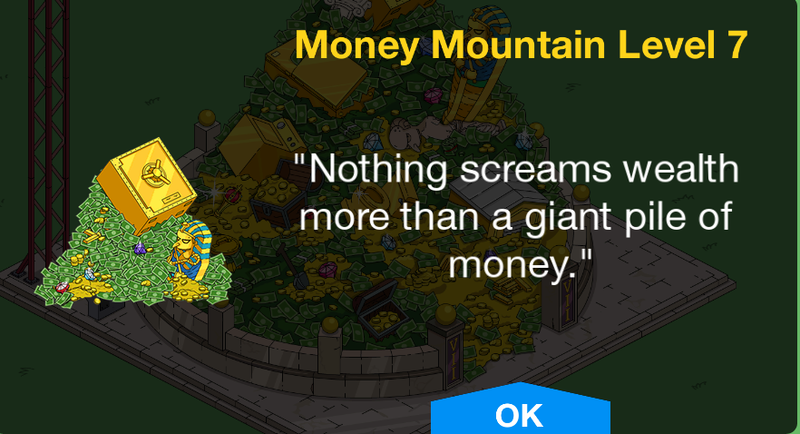 *Note: There is a glitch going on currently with Mr. Burns and the Money Mountain. Details on it are below. Update 5.8.15 9:18 PM EDT: Patch hit our games tonight and the Burns glitch is now fixed! So if you couldn’t see the task before try hard closing and restarting your game and ensure the update downloads (it’s in game so nothing to get from the app store) and it should now be working for you. There is a KNOWN bug going around that will make Mr. Burns’ task to empty his pockets disappear somewhere between $6,000 and $8,000 when you’re on Level 2. It will not impact everyone. I’ve got it in my game but Bunny’s been able to get past level 2 onto Level 3 without an issue. So sit tight. Hopefully the patch will hit soon. 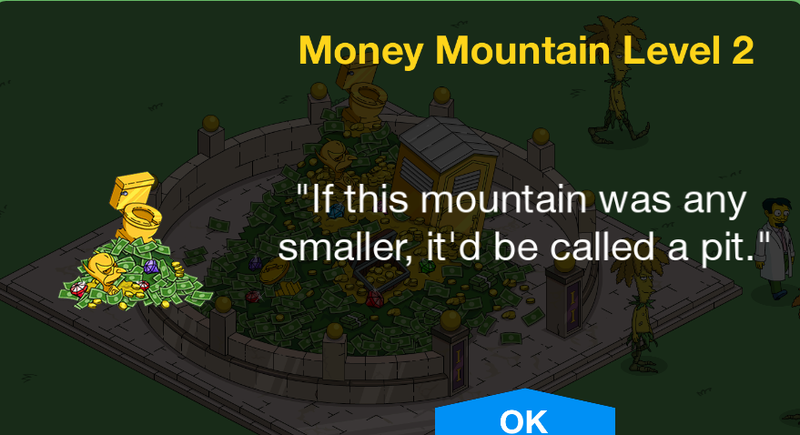 What’s the Requirement for Money Mountain? Do I Have to Be On Level 52? 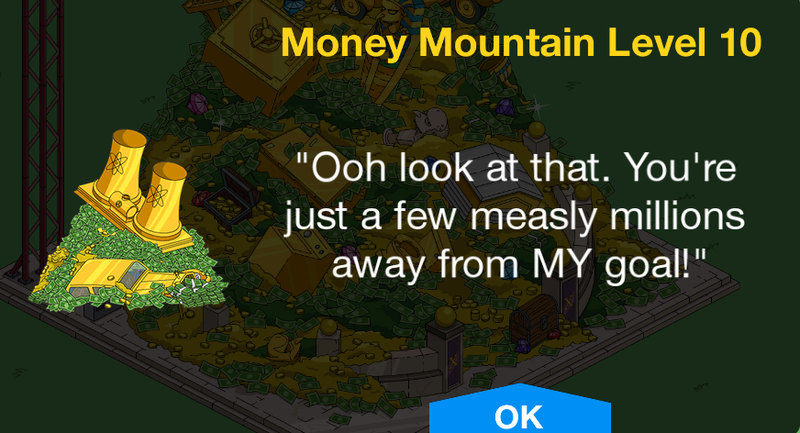 Nope, the Money Mountain doesn’t just apply to players at Level 52, despite it arriving with the Level 52 update. 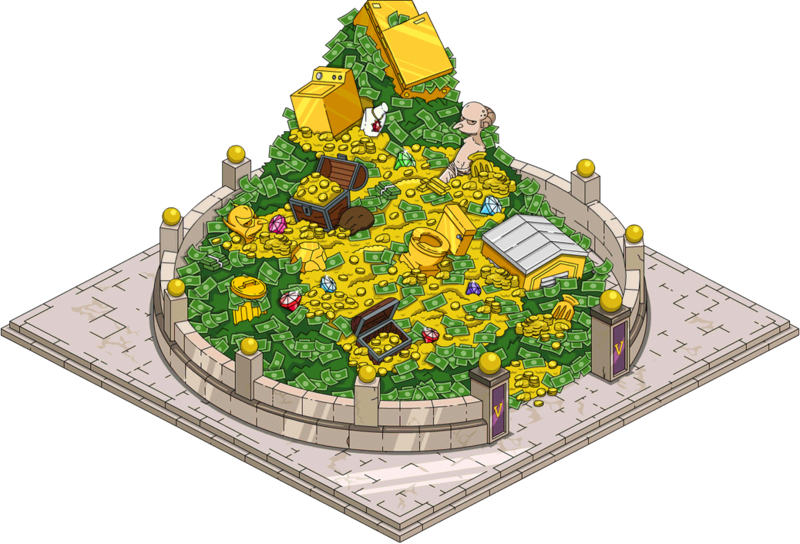 The Money Mountain applies to all players Level 25 and above. So many of you are seeing this quest popup in your game…despite not being at Level 52. How Does the Money Mountain Quest Start? A ! will popup over Mr. Burns starting the Rolling In It task for Mr. Burns and Homer. That kicks off the mini event. I’m At Level _____ (something higher than 25) and I Haven’t Had This Task Trigger For Me. What Do I Do? 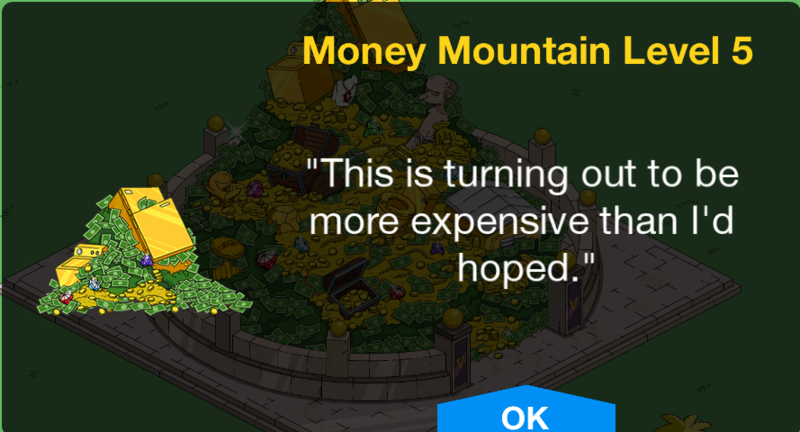 When Does the Money Mountain Quest End? Currently, there is no end date. It’s meant to be a long term goal, so take your time with it. There’s no rush to finish. 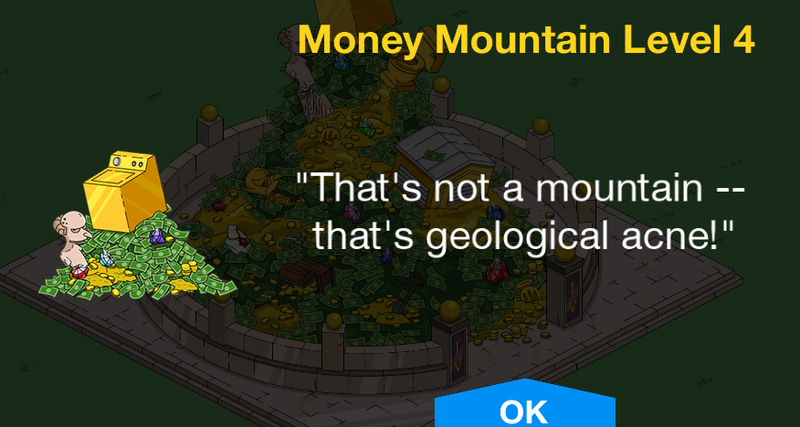 What’s the Purpose of Money Mountain? What do I Get If I Complete it? 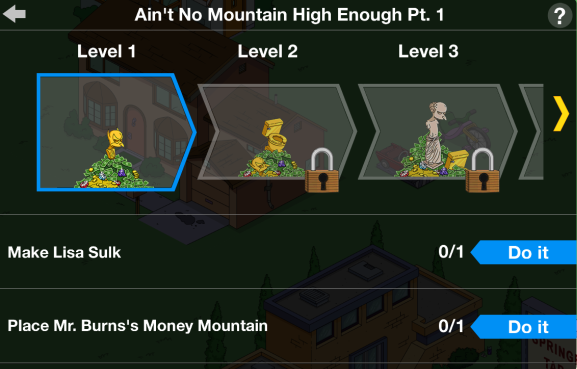 There are 11 Levels to Money Mountain if you complete all 11 Levels you’ll unlock the Monty Moneybags skin for Mr. Burns. 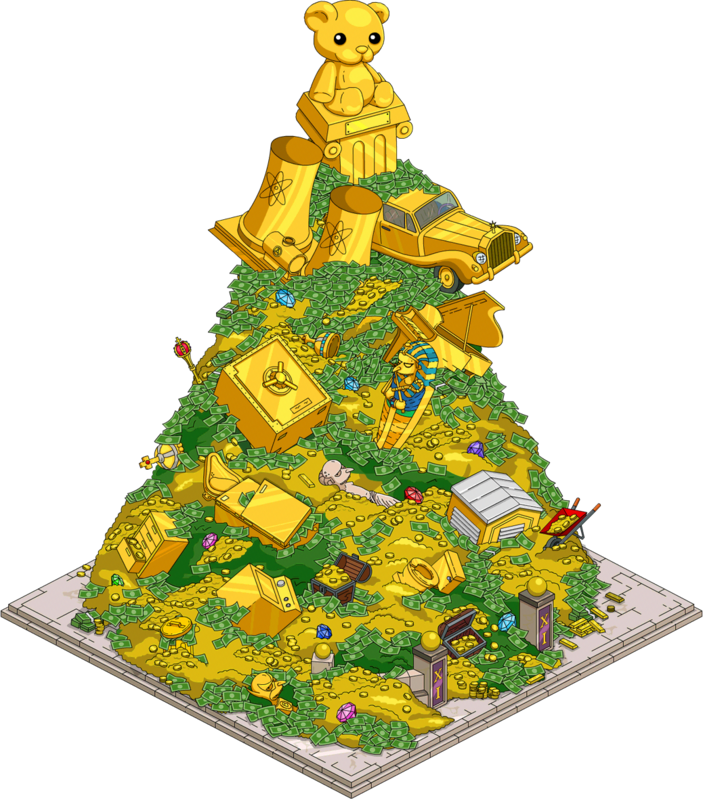 What Happens When Mr. Burns Throws Money Into The Money Mountain? It’s costing YOU money every time Mr. Burns throws money into Money Mountain. So YOUR in game cash will disappear each time you send Mr. Burns to “empty his pockets”. So again..take your time with it. It’s meant to be a long term goal. How Much Of My In-Game Cash Will Be Needed to Complete the Whole Event? The total through all 11 Level is $5,500,000. Do I Have to Do This Event? No. It’s not a requirement for anything, except to get the Monty Moneybags Skin. 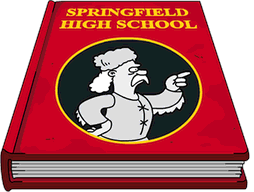 So you do not have to complete it to move onto any level/event in Springfield. It’ll just remain in your task bar. Does Monty Moneybags (the Skin you earn) Have a Questline? Yes, he’ll have a full 4 part questline (which we’ll cover later in this post). Does Monty Moneybags (the Skin you Earn) Earn at a Premium Rate? 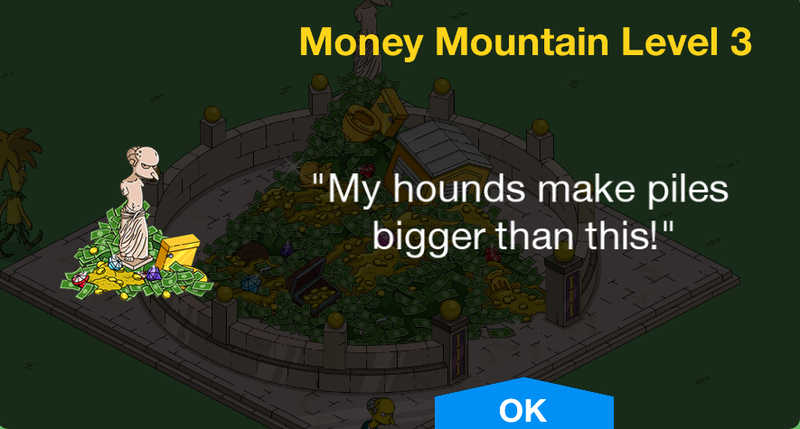 How Big is Money Mountain? Do I Have to Keep it In my Springfield? It’s 11×11, so pretty big. And no you don’t have to keep it in your Springfield. You can store it at any time in your inventory. What Will Money Mountain Do? Does It Earn Anything? It’ll change appearances with each level increase, it’ll grow in height and more stuff will be added (we’ll have images later in this post). It will not earn you in game cash/xp. It’s basically a giant decoration and will earn you 450 Vanity points for your Conform-O-Meter. So now…let’s get into more specifics about the Ain’t No Mountain High mini event and breakdown each level. As mentioned above, as long as you’re on Level 25 Mr. Burns will start this quest for you. It’ll kick off with Rolling in It. 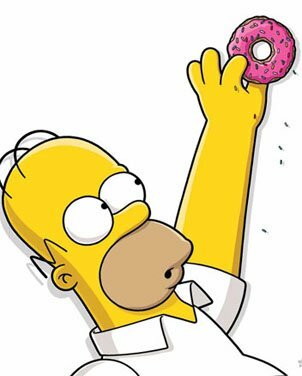 Which will give you a task to complete for Homer and Mr. Burns. 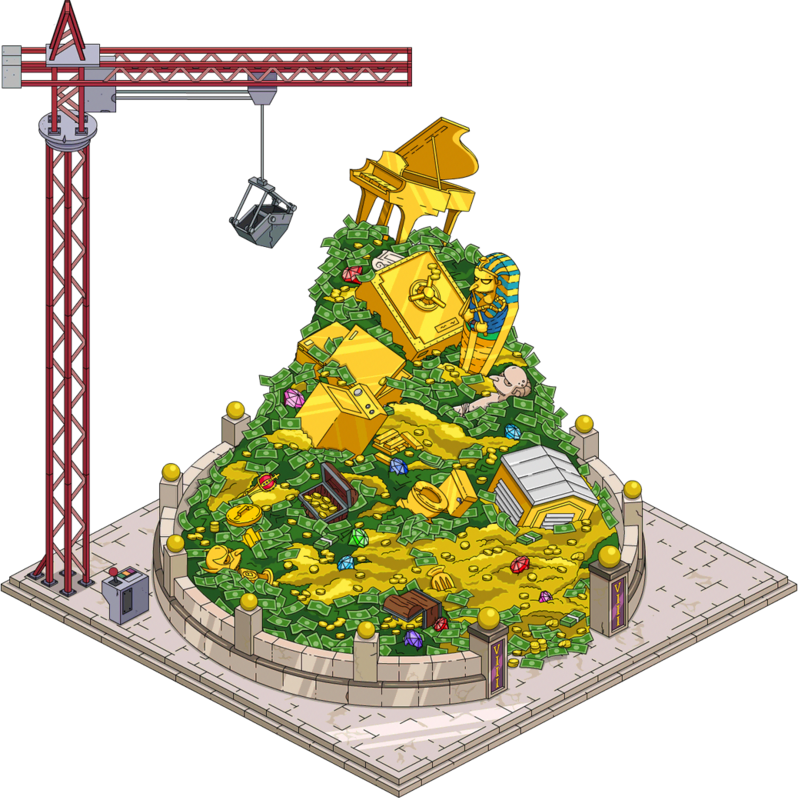 Place Mr. Burn’s Money Mountain– Costs $5,000. Requires Level 25. 11×11 in size. 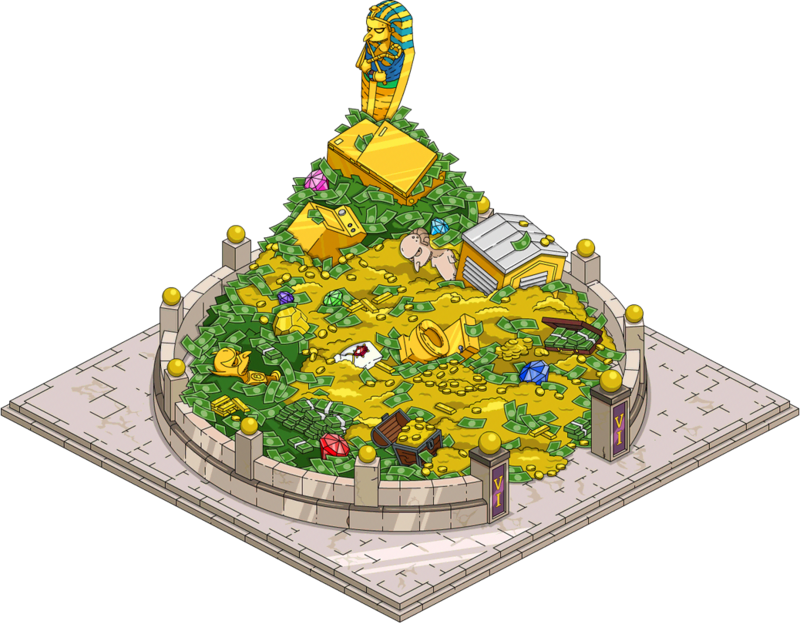 The level 11 image above is how the Money Mountain will look in your Springfield when the task is complete. Once you’ve completed all 11 Levels you’ll unlock the Monty Moneybags skin. However, in order to get the skin you must first trigger the questline by Mr. Burns. He should appear with a ! right after you’ve leveled up to Level 11. The Monty Moneybags skin will be placed in your inventory…. Whew! 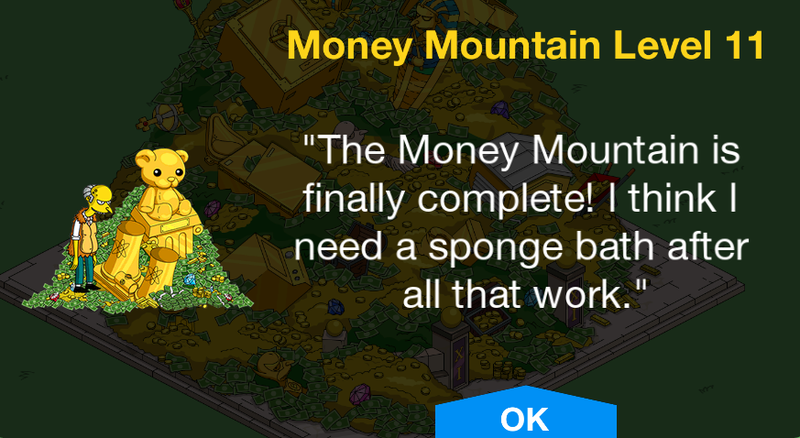 And there you have it my friends…everything you need to know about Money Mountain and Monty Moneybags! My best advice…don’t worry about it right now. 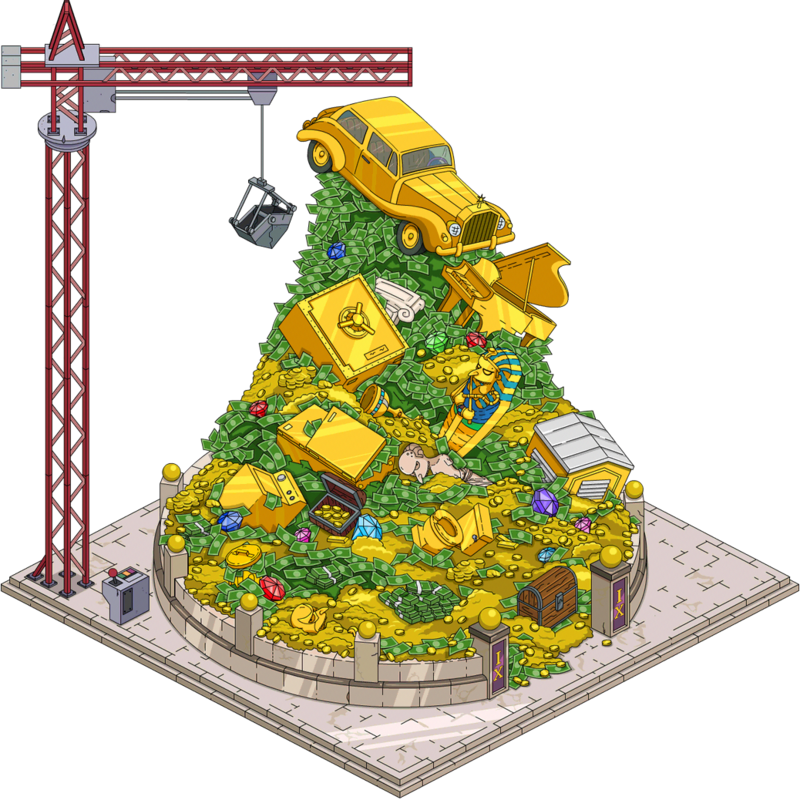 Money Mountain will still be around after the Terwilligers Event is over. So right now focus your time and character tasks on earning that crafting currency for Terwilligers, because that is limited-time. Think of Money Mountain as a side quest. Something to do when you’re bored in TSTO & don’t worry about it right now. Also, one quick note. 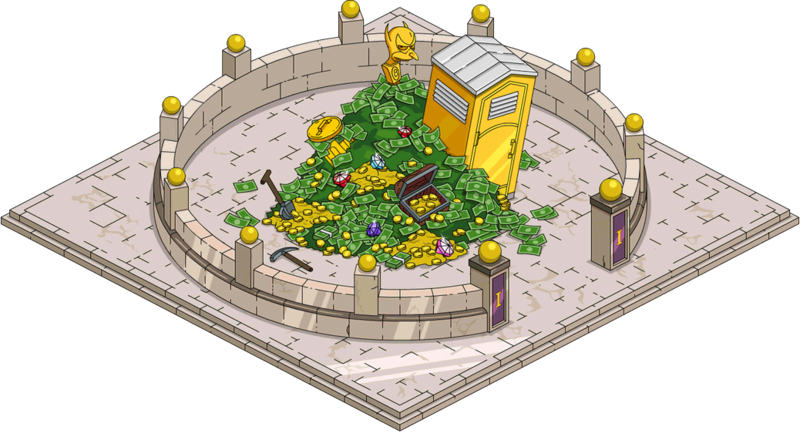 Since this is a permanent addition to our towns..this post has been permanently linked on the menu of TSTO Addicts. 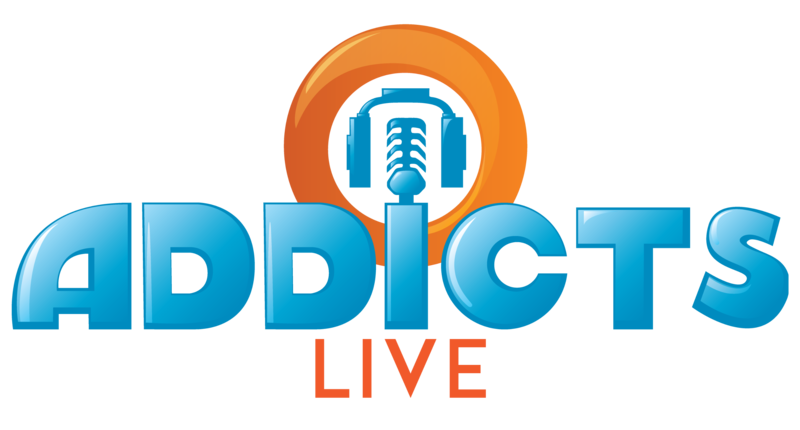 So you can quickly come back to reference it at any time by going to the navigation menu of TSTO Addicts and it’s listed under Tips and Tricks. 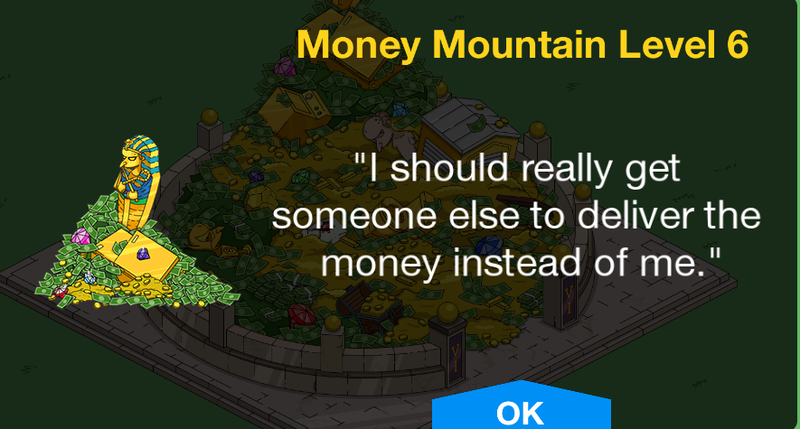 What are your thoughts on Money Mountain? How about Monty Moneybags? Have you started the quests or are you waiting? Thoughts on Monty Moneybags payouts? 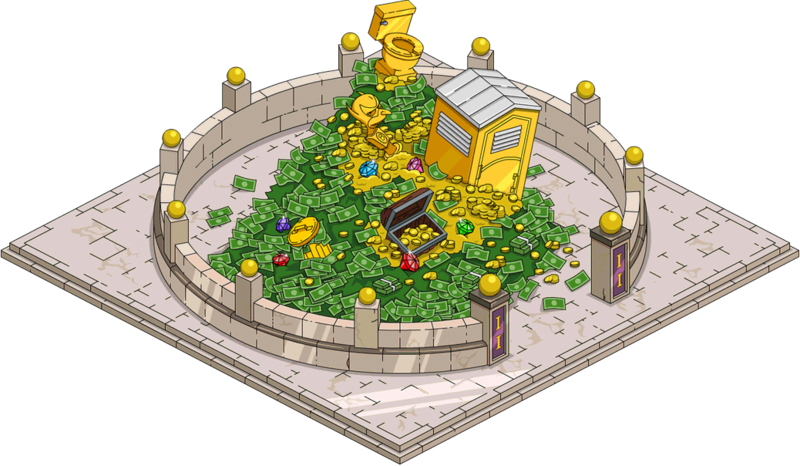 Will you be storing or keeping Money Mountain in your Springfield? Sound off in the comments below, you know we love hearing from you! 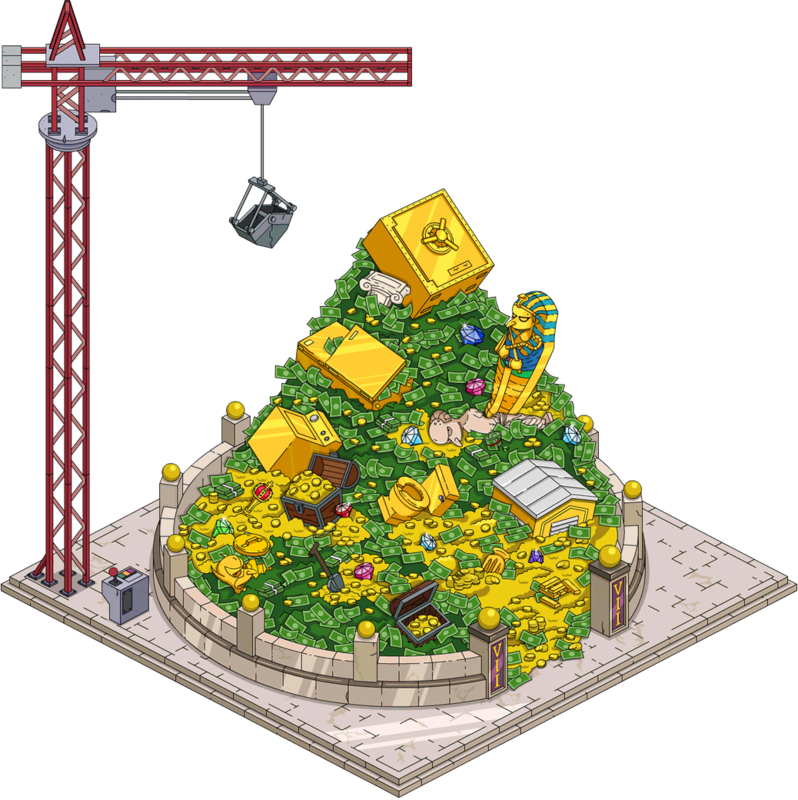 This entry was posted in Characters, Decorations, Tapped Out, Tips and Tricks, Updates and tagged do i have to keep money mountain, How do I get Money Mountain, How do I get Monty Moneybags, how much will money mountain cost, money mountain glitch, money mountain questline, Monty moneybags questline, monty moneybags tasks, Mr. Burns with Vest, Tapped Out Tips and Tricks, The Simpsons Tapped Out, TSTO Addicts, TSTO Money Mountain, TSTO Tips and Tricks, When does money mountain end. Bookmark the permalink. I’m extremely bummed to find out that I’ve been working endlessly on something that has gained me nothing but a stupid vest and cost me a $5,500,000!!! Seriously- WTH?! I have literally been spending all my earnings on this ridiculous quest. I think this has happened at least twice to me. 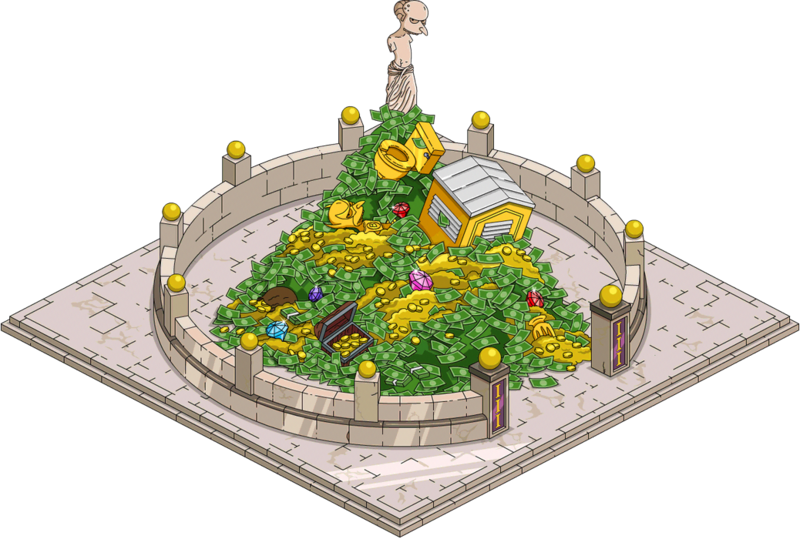 At level 11 when Mr. Burns finishes dropping $125.000, the total amount does not increase. It stays as if I never sent him on the task and I lost the Money. The first time I thought I was mistaken but it happened today again. Very frustrating! 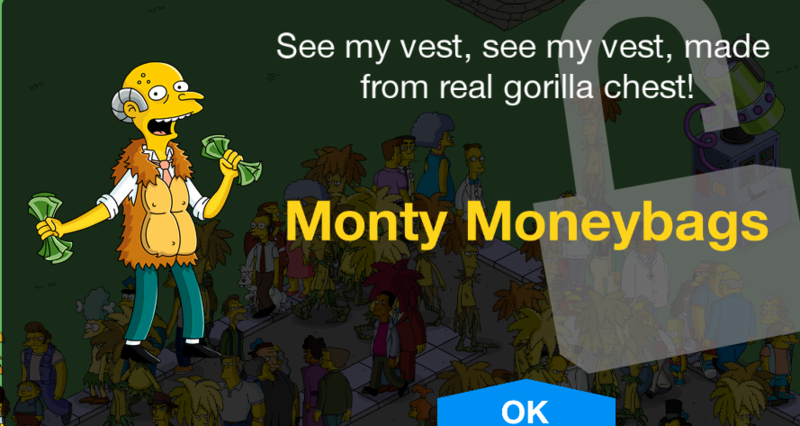 Lamest quest ever, I don’t get why the heck I should spend that enormous amount of money for a crappy gorilla vest. They should pay me back, that would be quite an amazing reward. Help! My money mountain quest has vanished. It is still a job for burns but it doesn’t show up in my task window and I don’t know if i’m progressing at all. Help! 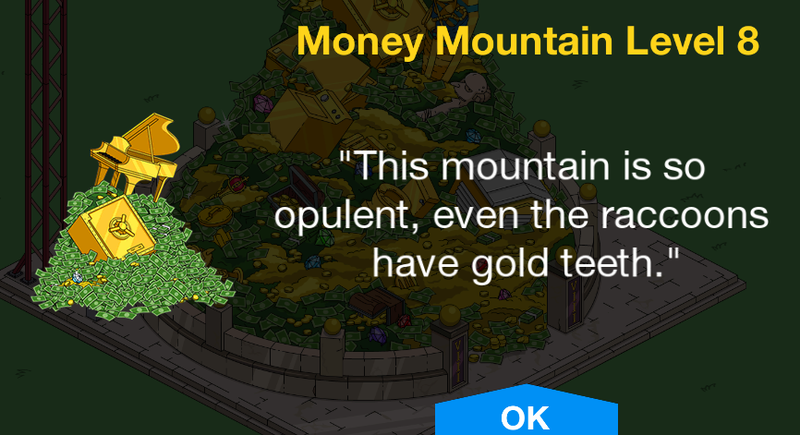 Money Mountain and the redwood have both been suspended until after the event ends, at which point they should return. If you turn on your XP multiplier, you will level up really quickly with this mini game. Many, many donuts earned. The quest I think will trigger after completion of the level 25 questline. What do you get when you finish? 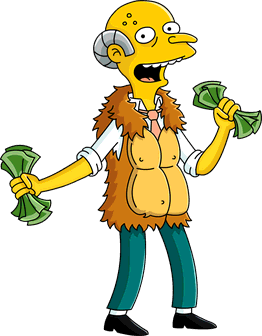 Like do you really spend $5,500,000 just to get Mr. Burns in a vest? My point is, is it really worth doing? I redid my game a couple of months ago and only just put the money mountain back in it out of storage this week. I’ve just gotten to where the end of level 2 is and my game indicates i’m ‘done’ but nothing is coming up to recognise i’ve finished level 2 so tasks come up for level 3. this doesnt sound like the bug that affected players last year. has this happened to anyone else?? I’ve tried hard closing and going in/out of friends – what else can I do? Thanks in advance! And apologies if it’s obvious and i’ve missed something! Hello, I do not know if it is an update or something but to complete level 6 of the mountain, I can expend 25,000$ each 30 minutes or 50,000$ in 6 hours instead of 5,000/30 min and 10,000/6 hours as stated in this post. Changes were made after this post. Take the option best for you and your ability to restore that lost income if needed. 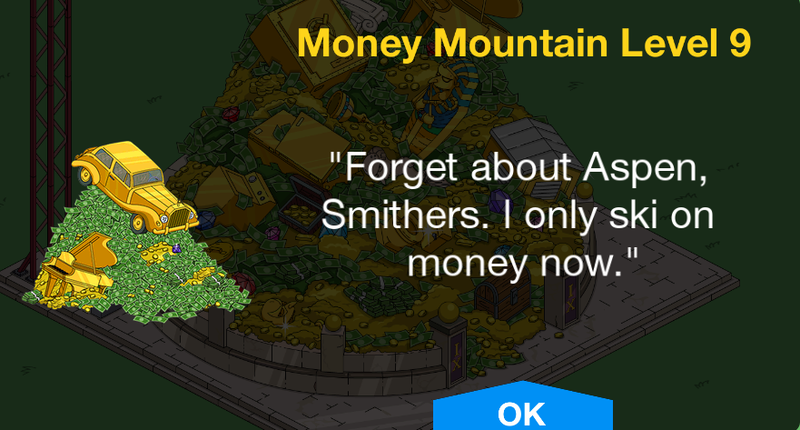 I finished upgrading the mountain and it said i got the monty moneybags outfit, but when i looked in my inventory it was gone and it wasn’t already on mr burns and now i can’t get it for some reason. Have this problem solved for you? I emailed EA but they’ve got the most unhelpful reply. I think this will be one of those items I never finish. I like the visual of the crane. If I pull Burns out of a quest, will I get the $250K back? Nope. Cancelling a quest cancels all put into it and/or that would have paid out if completed. So for lvl11…is it better to pay $125,00 every 3hrs? Or pay $500,000 @every 32hrs?